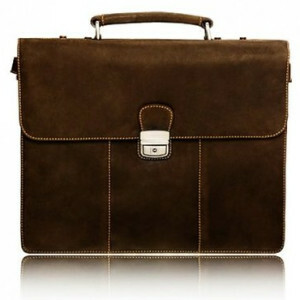 Many briefcases today are quite versatile so we are presented with so many choices. Some of us have a specific style in mind. So if you’re after a stylish, slim and formal looking briefcase, then take a look at the Visconti Apollo 16038 Oil Tanned Leather Briefcase. 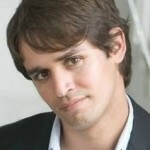 In today’s business society, appearance and organization is paramount to a modern and professional businessman. My review will go through the many benefits of this luxurious leather briefcase which will help you come to come to a decision on whether this is the right briefcase for you. 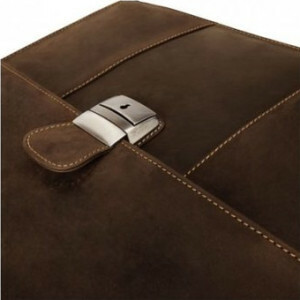 Dimensions (inches) 15.75" x 13" x 7.48"
The design of this luxurious leather briefcase gives off the image of a highly successful executive which makes it perfect for everyday work use within a corporate setting. It is made with high quality leather and comes in a beautiful oiled chestnut brown color with contrast stitching and a flapover closure complimented by a single brass push lock that snaps and locks securely into place. 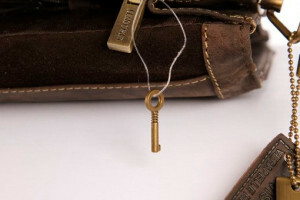 The lock comes with small keys to unlock your briefcase so be sure to keep your spare somewhere safe. The frame of the Visconti Apollo 16038 briefcase is firm and sturdy which will keep your papers from creasing or bending. You won’t have to worry about the briefcase ever losing it’s shape or ‘falling over’ (like most soft briefcases do) when it’s placed on the floor or table. With the flapover closure and push lock, it ensures an ease of opening to access your items inside the briefcase. You won’t need to fiddle with zips or worry about whether you have zipped up your briefcase. 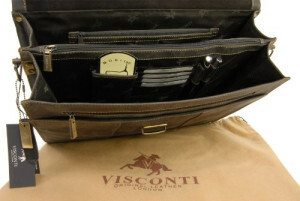 The interior of the flap is lined with suede and the interior of the briefcase is lined in the traditional Visconti signature fabric making it attractive on the inside as well as the outside. There is a slight vintage look to this briefcase due to the color and the antique looking metal fittings which makes it look expensive but yet shouts out luxury, tradition and quality. It is a briefcase to be admired and taken care of. The adjustable strap comes with a padded sliding shoulder grip providing support and comfort when used on the shoulder or across the body. If you prefer to carry your briefcase instead, the strap can be easily removed and the leather carry handle can be used instead as it is wide enough to fit large hands and with the soft padding, it will be comfortable enough to carry for long periods of time. The sleek and smooth leather material is sturdy yet lightly padded on the exterior making it soft to the touch so there will be no sharp edges of your briefcase hitting against your leg or hip when you’re walking. The weight of this briefcase isn’t heavy either; many people have found it to be quite light even when carrying a laptop inside it. This briefcase will keep you perfectly organized with so many compartments including an exterior zipped pocket at the back to store items that can be quickly accessed on a daily basis. Inside, there are 2 large open main compartments on either side with 1 zipped compartment in the middle to keep your valuables hidden and secure. The main compartments are large enough to fit a 15” laptop. You will find that there is also a smaller zipped pocket inside the briefcase at the back, another zipped compartment inside the briefcase at the front, a thin compartment at the front for slim documents, slots for your cards, a pocket for your smartphone and 2 pen holder slots. 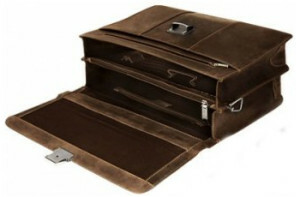 However, despite the many compartments this briefcase offers, not all will be able to fit such bulky items. The idea of the briefcase is to fill it with important documents, paperwork or a slim laptop which are essential daily items for a businessman. This briefcase is recommended for a professional businessman who is after a slim yet stylish briefcase and doesn’t plan to carry too much. I would not recommend carrying anything too heavy or bulky in this briefcase either as many people have found that this causes the poppers on the strap to pop off. Despite this, it is a very durable briefcase due to the firm frame, excellent leather and strong double stitching and provided that it is well looked after, it will last you many years. I view this briefcase as a rare find as other styles I have come across offer a luxurious design and feel but they are often too bulky such as the Floto Venezia leather briefcase. However, if the Visconti Apollo 16038 briefcase is not slim enough for you, then check out the Kenneth Cole Reaction A Brief History briefcase instead.